In this essay I examine the interpersonal dynamics of guru-shishya relationship, whereby in the bhakti tradition the guru ascends to a deified status through which a new kind of guru emerges—one who has severed ties to the old Vedic tradition, and is no longer revered for ritual expertise, but rather now worshipped—deified, not as avatars, but as God incarnate. Tracing the trajectory of guru devotion from its origins in Vedic and Upanshanic literature to its highly devotional structures in the Bhakti and Tantric Traditions (keeping in mind that older guru traditions were not replaced, but continue to coexist with new emerging guru-shishya traditions such as bhakti and tantric), I examine contemporary gurus such as Ramakrishna, Swami Sivananda and Sathya Sai Baba with an analysis of how such deified gurus have come into existence and why they are so revered. The concept of guru is rooted in its etymology. "Gu", means darkness (Raina 2002:169) or ignorance (Mlecko 1982:33) and "ru" meaning lightness (Raina 2002:169) or dispeller (Mlecko 1982:33), thus the guru is a dispeller of ignorance, a teacher who can lead the student out of darkness and into the truth of ultimate reality. The origins of the guru-shishya relationship can be traced back to the early Vedic tradition (1500-500 B.C.E.). The early institution of the acarya (guru) functioned to transmit various parts of the Vedas to the pupil (usually drawn from Brahmin, Ksatriya or Vaisya castes), who usually lived with his guru in a rural area free from worldly distractions. Because the use of written texts was rare in Vedic times, the guru, who was generally a brahmana householder, used sophisticated mnemo-systems to ensure accuracy of the Vedic transmission (Broos 2003:74). With emphasis on grammar, metrics, etymology, mnemonics, as well as correct accent and pronunciation, the student was initiated (diksha) into ritual Vedic matters of philosophy and spirituality. The guru was a vital repository of truth or ultimate knowledge and a necessary guide to right ritual action as dictated by the Vedas (Mlecko 1982:34). O' teacher, grow thou pure for my outward breath, and impart knowledge to me. O 1 giver of spirituality, grow thou pure for my spreading breath, and supply food to me. O imparter of knowledge grow thou pure for my upward breath and grant me prowess. O' preacher of truth, be attentive to my speech and eminence. O educator teach me as how to improve my soul-force and intellect, and how to acquire sound knowledge. O teacher of grammar, teach for my ear that catches sound, the relation of the words with their meanings and their use. O' learned guest and teacher teach me true principles. (Chand1959:75). Thus, the early Vedic guru was not only a ritual priest, but also a teacher of respect and obedience because he belonged to the right family and he knew and could recite the Vedas. Still, this Vedic guru had not yet attained that statue of awe and veneration of an incarnated divine being—this guru would develop later in history. However, the status of the guru in the Upanishadic period (800-500 B.C.E.) changes from that of "a known and dweller in Brahman to being the only conduct to Brahman" (Raina 2002:170). The Upanishads reiterate the necessity of the guru-shishya relationship and that self-study is futile and fruitless and will not lead enable the shishya to attain the sacred knowledge, that is how the atman was identical with the divine brahman, the Ultimate Reality. The Upanisadic guru was an ascetic who had renounced the material entrapments of the householder life, and was skilled in esoteric and mystic ways of metaphysical knowledge. This endowed the Upanisadic guru with greater authority (Broos 2003:74). In the Mundaka Upanishad we find evidence that emphasizes the kind of guru a student seeking knowledge of Brahman should approach—someone who has detached himself from the material world, who is well versed in the Vedas and has attained the highest knowledge of God. Having examined the worlds attainable through Karma a Brahmana should get dispassionate (vairagya) towards them. The Uncaused (Atman) cannot be had by the caused. To know that, he (the student), with sacrificial fuel in hand, must approach a Guru who is well-versed in the Vedas and absolutely devoted to the realization of Brahman (Sharvananda 1920:24). Note that the student is also highlighted in this text, "with sacrificial fuel in hand" meaning that the student must be prepared to offer himself completely to the service of his Guru, to collecting the sacrificial fuels and fruits, drawing water, tending cattle and other personal works devoted to the service of his Guru (Sharvananda 1920:26). Atman, when taught by an inferior person, is not easily comprehended, because It is diversely regarded by disputants. But when It is taught by him who has become one with Atman, there can remain no more doubt about It. Atman is subtler than the subtlest and not to be known through argument (Nikhilananda). For I have heard from persons like Your Reverence that it is only knowledge learnt from the Teacher that becomes the best, acquires its highest character; hence the 'Your Reverence' alone should teach me (Jha 1942:198). 'Revered Sir, as I am, I know only the verbal texts, I know not the Self. It has been heard (learnt) by me from persons like your reverence that on who knows the Self passes beyond sorrow; I am in sorrow; please, sir make me pass beyond that sorrow.' He said to him, 'Whatever you have studied is mere Name.' (Jha 1942:369). Service means attending upon and being devoted to one's guru to attain knowledge of Brahman (Jha 1942:400). One of the primary duties of the shishya would be to gather firewood and attain alms for his guru. This signifies the shishya's desire to share the guru's domestic sacrifice and maintain it. Furthermore, to attain true Self, it meant living with reverent and obedient service to one's guru (Mlecko 1982:37). How did the shishya's relationship to the guru change from that of a spiritual guide and ritual priest into an object of devotion? What elements were at play to shift the relationship and refocus the guru as the divine? There is a presupposition in the Epic literature that both human and the divine require a guru. Passages in the Ramayana show that the deities themselves had gurus, such as Brhihaspati, who would act as their master of prayers and sacrifices and provide counsel (Mlecko 1982:40). Moreover, Rama' in Book III of the Ramayana explains that even though knowledge of the Vedas leads to liberation, the way of bhakti is a more admirable way. Rama underscores the importance using the senses to enhance attitudes towards the deity and lists nine elements, one of which is devotion for gurus (Organ 1970:279). The significance of this bhakti passage is that there is a moving away from the Brahamanical domain of memorization and recitation of the Vedas, to the elevated status and importance of the guru; thus diminishing the position of the priest, scripture and suggesting even the gods themselves are not as important as devotion to one's the guru (Mlecko:1982:41). Rama indicates a shift away from the study and memorization of Vedic scripture and the importance of the ritual priest, to a more excellent way—bhakti, which is independent of knowledge and requires the use of the senses for the enrichment of attitudes towards the deity. This of course changes the qualification of the guru from skilled Vedic knowledge to ecstatic devotion—a qualification that overrides lower caste birth and illiteracy that would otherwise disqualify the guru of earlier periods (Broos 2003:76). This knowledge should be learned by accepting a spiritual master and by submissive inquiries and rendering service unto him. The self-realized and holy saint endowed with divine revelation will instruct you in wisdom (bhagavad-gita.org, IV, 34). An important homocentric perspective dominates Epic literature and transfers the purely divine elements to a more subordinate position as illustrated by narratives that speak of man's greatness and of gods in human form serving men (Mlecko 1982:43). The anthropormorphization of the gods is a significant development in the movement away from the gods as amorphous entities of the Vedas and Upanishads to an increasing focus on embodying the divine in the human guru, thus setting the stage for their subsequent deification in the Puranic and medieval period where the guru is fully identified with one's personal deity (Broos 2003: 76). For the one who led by the illusory energy, forgetful of God, turned away in misidentification will fear rise because of being absorbed in things second to the Lord; for that reason should an intelligent person, regarding his guru as his Lord and Soul, worship Him, the Lord fully with unalloyed devotion (II, 37). There, with the guru as one's soul and deity, should one learn the bhâgavata dharma by which, without deceit being faithfully of service, the Supreme Soul, the Lord bestowing His own Self, can be satisfied (III, 22). The teacher of example [the âcârya] one should know as Me; he should never at any time enviously be disrespected with the idea of him being a mortal being, for the guru is the representative of all the gods (XI, 27). With the necessary material must he, connected in bhakti, free from ulterior motives worship Me, his worshipable guru, in an image, an altar, a fire, the sun, the water or in the twiceborn heart itself (XXVII, 9). A brahmana who is a great devotee of the Supreme Personality of Godhead is the spiritual master of all human beings. Everyone should worship him as if he were Lord Krsna Himself (Goswami p.17). It implies that one should worship the guru first and then Krsna (Broos 2003:77). Theologically, the text does not implying the guru is god, but rather suggests as an intellectual and practical application of worship whereby one respects the guru as a wife would respect her husband like a god—meaning the "guru is as good as God, but not God himself" (Broos 2003:79). Furthermore, for the shishya to fully understand the secret nature of what the guru has to impart, the shishya must have complete faith in his guru and view him not as a limited, moral being, but instead a like a god (Broos 2003:79). What were factors that contributed to a shift in the perspective of God "descending" (avatar) to man "ascending" into divinity? With the Bhakti tradition, the ideal personal characteristics of the guru are not defined by a list of scriptural ideals. Instead, a guru who embodies actual lived qualities defines them. Delineated as affection and submission, the guru-shishya practices of the Vaisnavites and Saivite sects show how guru-deification and worship was constructed and authorized in the Bhakti Cults (Mlecko 1982:46). The emergence of bhakti and a new kind of guru—who was revered for his inspirational attributes rather than his education and teaching abilities—occurred in the Hindu revival period of the seventh century C.E. Highly influenced by Buddhist and Jain doctrines which suggested messianic powers of persons, coupled with the Bhakti movement, facilitated the emergence of a cult of personality whereby devotees enshrined the spiritual, mystical Guru as prophet and mentor (Kale 1970:372). This intimate, devotional association between shishya and guru reveals a reaction to the highly intellectual thrust of jnana and Sankara's Advaita Venta which eluded the popular mind at the time. Instead, medieval philosophers proclaimed bhakti as a favored means of liberation (Mlecko 1982:48). An examination of the philosophical approaches by Ramanuja, Nimbarka, Sundarabhatta, and Ramadasa provided the rationalism for bhakti and facilitated the view that the guru is the central focus for seeing God and achieving moksha. As a metaphysician, Vaisnavite teacher Ramanuja bridged the bhakti tradition with Vedanta and provided the rational for intense Hindu devotionalism. Furthermore, by proclaiming that even the Sudra and outcastes could achieve salvation by unreserved surrender and devotion to the guru, Ramanuja democratized the movement and prescribed the impetus for a new kind of guruhood (Mlecko 1982:47). Nimbarka, an eleventh century C.E. philosophical leader of the bhakti movement established five basic paths to salvation, one of which was devotion to the guru who is responsible for doing what is necessary for the devotee to attain salvation (Mlecko 1982:47). Sundarabhatta, a follower of Nimbaraka, reinforced the notion that bhakti to one's guru was the best path for salvation because it united karma yoga (obeying the guru precepts), jnana yoga (knowing the atman) and bhakti yoga (devotion to the guru) (Mlecko 1982:48). He who regards God as superior to the Guru is a fool...Before the greatness of the Guru, the greatness of God is as nothing...God is made God by men by the power of Mantras; but the Guru cannot be made even by God. The power of God is the power of illusion; the power of the Guru carries everything. Dasaboda V, 3, 40-46 (Mlecko 1982:48). In the Vedic tradition, the Brahmacarin commanded strict obedience from the pupil who stayed with him in his asrama, usually from a young age to as long as 24 years, during which the shishya would, in exchange for the guru's instruction, perform menial service for him and his family. Graduating, the student now a full fledged member of the varna of which he was born into, owed nothing more to the guru (Broos 1970:73). The ongoing historical development of the guru institution would, by the seventh century, find the guru in a position of great reverence and worship by the shishya within the Vaisnavite and Saivite bhakti sects (Mlecko 1982:50). The Guru in Gaudiya Vaisnavism was necessary to help the pupil on the path of bhakti to shed himself of all maya by initiation through several stages, one of which is service to the guru and another is learning the acarna rites from the mantra-guru (Dimock 1963:117). Moreover, the guru goes beyond just being a teacher or guide, he is considered a saviour. Jiva Gosvamin explains in his Bhakti-sandarbha that the mantra-guru is the greatest of gurus and is the highest truth and can release the disciple from samsara. The logic of the guru as a saviour is tied to the notion that the true guru is an unbounded liberated soul and by worshipping Krsna and serving the guru, the disciple is released from the web of maya (Broos 1970:89). Thus, by being devoted to the guru, one is devoted to Krsna, but if you want a relationship with Krsna, you must have a guru who functions as a "practice Ksna" who helps the disciple cultivate an attitude of affectionate intimacy (Broos 1970:92). Krsna recognizes his own blissful nature tasting the adoration of himself objectified in another person to whom he directs his sweetness (Dimock 1963:115). Therefore, only the Gaudiya Vaisnava guru, through his meditation and visions, has the ability to see the initiate's true identity—his inner gopi-identity, which is necessary if his pupils are to emulate gopis and win the affections of Krsna and his liberating grace. (Haberman 1985:45). Virasaivism places the guru first among its eight shields (astravarana) required for the devotee to connect with the Infinite reality—for it is the guru who initiates the devotee at birth with the linga, sanctifies water and food (padodaka and prasada), and guides the pupil in the use of the astravarana. Furthermore, in the world of the Virasaivite, there is great reverence placed on the guru, and satisfaction in serving and imitating one's guru to acquire his knowledge. Jan Gonda, noted Indologist, explains that all religious schools agree that the qualified guru is the only one who can initiate others, and amongst both the Saivas and Vaisnavas, the guru is regarded as representing God himself (Mlecko 1982:51). Furthermore, these bhakti cults fueled the concept of the divine guru and their subsequent worship, which was founded on the notion that the guru was one with God; therefore he was worshipped as God, which fused both guru and devotee as one. Thus the shishya's devotion to his guru must be unconditional in the same vein as God (Raina 2002:178). The practice of guru devotion and worship emulated deity worship in the temple. Incense was burned in the presence of the guru, devotees would prostrate themselves before their guru, water was used to wash the feet of the guru and subsequently consecrated, would be drunk by the devotee; betel chewed by the guru would be taken as prasadam, as well as presenting one's guru with offerings (Mlecko 1982:51). In some cases, such as in the Caitanya cult, devotees, in addition to servile veneration, were required to make everything they had available for the guru's disposal (Mlecko 1982:50). The renaissance of the bhakti tradition between the thirteenth and seventeenth centuries put the guru front and center as a key aspect for devotional worship. Poet, Jnanesvara illustrates this perspective in his Bhagavad Gita commentary, "Jnanesvari," where he exalts the guru, deserving the complete focus of the shishya who makes himself a worshipper of his one and only object of worship—the guru. This results in all desires coming to fruition (Mlecko 1982:49). In another example of guru deification, fifteenth century Bhakti poet, Kabir, rejecting caste, having little regard for scripture and renouncing all philosophies maintained that only a spiritual guru could safely navigate the dangerous waters of this materialist world. Furthermore, Kabir argued that if one could recognize the true guru, one could see God (Darshan) and without a guru's grace, one could not escape samsara (Mlecko 1982:49). Lastly, the Tantric guru represents the climax of guru deification, where little emphasis is placed on Vedic knowledge. Instead, this guru—whose secret, complex and esoteric practices and various magical mantras—represents a break from the Vedic Brahmins and has ascended to a union with the highest reality, achieving moksha through devotion and knowledge of Tantra. Moreover, in addition to the necessity of the guru in shishya initiation, the Tantric guru is the most important person in the life of shishya and is considered identical with God, and in some instances even more important (Boos 2003:76). Indeed, the Guru is father, Guru is Mother, Guru is God Maheswara Himself (Pandit 2007:80). Without a Teacher, all philosophy, traditional knowledge, Mantras are fruitless (Pandit 2007:101). Indeed, it is only when the high Guru gives himself to the disciple that he becomes liberated, free from birth (Pandit 2007:78). Look towards the direction in which the lotus feet of the Guru lie and bow to it every day with devotion...no god higher than the Guru...At the root of dhyana is the form of the Guru; at the root of puja is the feet of the Guru; at the root of the mantra is the word of the Guru and the at the root of all liberation is the grace of Guru. In this world all holy actions are rooted in the Guru (Pandit 2007:78). The Tantric guru is bound neither by caste or heredity and dismisses them as material ornamentations. Moreover, the Tantric guru indicates that the salvation experience is immediate and lasting in this physical lifetime and is open to all who seek. Devotion to the Guru is the one main truth; without that all learning, all austerity, family status, observances are useless; they are only decorations pleasing to the worldly eye. Whatever one's station in life, if he be devoted, he is dear to the Lord and adorable as the Lord Himself (Pandit 2007:78). Furthermore, the Tantras reveal the greatness of the guru whose powers can save a disciple even from the wrath of Shiva himself, but underscores that a guru's fury is the most powerful of all. Even when God Shiva is wroth, the Guru is the saviour; but when the Guru himself is angered, there is none to save (Pandit 2007:80). Lastly, the Tantras are explicit in that offering bhakti to one's guru as an easier alternative path to salavation, knowledge and liberation. Why the pains of long pilgrimages? Why the observances that emaciate the body? All the fruit anticipated from such austerities can be easily obtained by motiveless service to the Guru. The Sruti declares that for those who seek for fulfilment and liberation, who aspire to attain to Brahma, Vishnu and Isha, devotion to the Guru is the Path and no other (Pandit 2007:79). How does guruhood continue to influence, grow and adjust to modernity? What tensions exist between the spirituality of the East and the technological innovations of the West? By highlighting the roles of both guru and shishya, and how their interconnected relationship has evolved through Hindu history (from that of a respected teacher, who initiated pupils into the duties of a householder, to being revered and worshipped as God himself), I will show, through an examination of contemporary gurus such as, Ramakrishna, Swami Shivananda and Sathya Sai Baba and their unique personal histories, how the construction of modern guruhood, which rests on a long tradition of guru reverence, is shaped by charismatic identities as saviours, brokers with God, rehabilitators of souls, and performers of miracles functions in modernity. Ramakrishna was the precursor to the modern guru—a guru for the emerging urban middle class of early 20th century India. His rustic, rural brahman demeanor and peasant wisdom had much appeal to the over-worked, under-paid urban chakris who had little time for religious ritual and sought salvation from the tedium of the impersonal time-clock (Sarkar 1992:1547). His simple form of playful bhakti, his childlike surrender to the Shakta divine mother-like that of kitten clinging helplessly to its mother, offered an emotionally satisfactory escape for many seeking relief from the failed promises of urban clerical life (Sarkar 1992:1551). Furthermore, the lure of Ramakrisha's message was that it promised salvation through the inner world of bhakti even while carrying out one's duties as a householder (Sarkar 1992:1550). In many ways, much like most modern gurus of today who embrace spirituality rather than religion, Ramakrishna's catholicity was attractive to wider audiences. Furthermore, his relationship with devotees was relaxed and informal. He claimed no magical powers nor did he perform miracles or give initiation rites or mantras or insist upon absolute obedience. These practices and perspectives separated Ramakrishna from the more traditional gurus of his time (Sarkar 1992:1554). Moreover, the printing press and the power of the printed word, leveraged by many modern gurus today, certainly played a crucial role in spreading the word to wider audiences, thus increasing his exposure and reputation (Sarkar 1992:1554). Thus, we see Ramakrishna embracing a new kind of guruhood. A bhakti guru who is more spiritual than religious, who expects nothing from his devotees, and capitalizes on the modern muscle of mass media to help set a template for constructing the modern guru of today. No longer is it sufficient for today's guru to have a limited number of qualified shishyas. Instead, the modern guru seems to require mass audiences with allegiances from around the world, where devotees express their devotion in terms of money and volunteerism in a wide range of community projects across the planet. Contemporary gurus or religious leaders have become "brokers with God" who rehabilitate souls and act as saviours. "Godman" as they are sometimes called, are a new class of gurus who have been modified by modernity where traditional foundations of guruhood remain active, yet tensions at the margins of traditional Hindu culture and the borders of Western globalization actively create adjustment, variation and revision to the devotional aspects guru-bhakti. Some new movements such as Shivanada's yoga revival movement, blend the old traditional ways with the new—wearing robes and using symbols of older lineages, vows of celibacy and claims of living the renouncer's wandering lifestyle. But, but unlike the renouncer of the old religion who left the duties of a householder for the ascetic life in the jungle, this guru uses transcontinental flights to instruct the masses abroad in homes, offices, factories, businesses and governments around the world, only to return to India and find refuge in the ashram, which today resembles more of retreat centre or hotel for upwardly mobile devotees (Falk 2006: 247). Gurus, instead of meditating and instructing devotees on the finer nuances of achieiving the Ultimate reality, are busy scrambling to meet the demands of millions of devotees struggling with the everyday challenges of rapidly changing modern world. Capitalizing on the Western society's interest in all things spiritual coming out of the East, the profile of today's revival movement guru is an English speaking, well-educated, born into an upper-caste, well-to-do family who is very savvy at exploiting new forms of communication. Like most guru movements, the ashram has a publishing office—printing presses to meet the demand of millions of newsletter and magazine subscriptions, volumes of books, as well as mass reproduction CD-ROM recordings. Moreover, modern guru movements are leveraging their exposure with multiple communications and networking channels, including radio, television, films and the World Wide Web (Falk 2006: 249). Another element that adds to the charisma and reverence for the modern day guru movements are their ability to attract and mobilize large work forces of devotees with the financial resources to build and maintain hospitals and clinics, vocational training centers for low caste women, colleges and universities, as well as schools to teach armies of swamis who will serve as Hindu missionaries to constantly replenish and build the ever-increasing need for more devotees (Falk 2006:253). Lastly, these international gurus, positioning their organizations as spiritual movements rather than religious orders, have provided an all inclusive recruitment attraction. By distancing themselves from religion, they side step sectarian loyalties, prejudices and conflicts (Falk 2006:268). I conclude this paper with an examination of the epitome of contemporary bhakti-guruism, Sathya Sai Baba. This is the guru, who has built an organization, which rests on the foundation of a 3500 year old history of reverence and worship in the guru-shishya institution (supported by copious scriptural references, passages, and dissertations that span many Hindu traditions, sects and denominations), that numbers some 20 million devotees in 137 nations with branches in almost every Indian city (Falk 2006:260). Godman, Satya Sai Baba needs no guru, no initiation, no esoteric practice to unlock inner secrets for he knows he is the "guru who is God," as opposed to the "guru who is god-like," due to spiritual realization (Falk 2006:256). 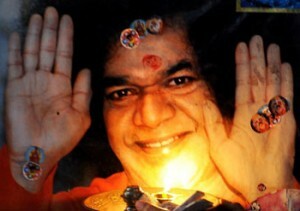 Sathya Sai Baba, clad in his orange robe gives his darshan to millions of devotees who seek to recharge their spiritual batteries while he openly performs miracles such as materializing ash, rings, gems, watches cameras and other objects from the ethereal realm in public displays of his powers (Warrier 2003:34). As a living-god guru, Sathya Sai Baba leads an immense world-wide organization that uses vast numbers of adoring devotees to build and run medical clinics, research hospitals, free schools, as well as massive community projects to bring fresh drinking water to hundreds of villages (Falk 2006:260). Viewed through prejudice, Sathy Sai Baba is considered a guru for the rich; he heralds the most broad-based following of any contemporary guru, with devotees summoned mostly from transnational middle-class ranks, including young and old alike. Furthermore, his devotees write books of testimony about his miraculous deeds, and can be found working on film and publicity projects (Falk 2006:260). Critics of today's mega-gurus—whose emergence seems to have capitalized on the growth of Western new age fads and fetishes for everything spiritual from the East—believe the guru-shishya institution has fallen into disrepute (Raina 2002:192). Devotees will hasten to possess a guru whom they believe can intervene to miraculously to solve various life crises. Thus, the efficacy of guru's power is embodied in his remedies to meet the demands of modernity. Sathy Sai Baba gives his devotees, who are consider participants, "not members," freedom and autonomy with his teachings and recommends spiritual practices which they can embrace or decline—a kind of "pick-and-mix" approach to spiritual life (Warrier 2003: 35). Regardless, Sathy Sai Baba channels both money and labour of devotees into productive Indian national projects. He tells devotees not rely on government to solve their problems, but rather take charge themselves by working together to change the world (Falk 2006:260). Similar to what Ramakrishna found with lacking in the chakris, the appeal of the modern guru to India's urban educated middle-classes can be explained by way of a perceived gap in their lives which can be bridged by attaching to a guru who can provide salvation and liberation from modernity's oppression (Warrier 2003:37). The guru principle seems to permeate many spheres of society including games, arts, dance, music and especially sports, all of which can be found under the influence of the guru principle (Vaidyanathan 1989:162). Perhaps the vast worldwide attraction to having a guru correlates to modernity and its entire myriad of communication networks in making gurus far more accessible to devotees. Devotees can now even connect anywhere, at anytime, with a virtual online guru. Some might argue that the bond between the guru and the shishya has been weakened in the course of modernity and all of its distractions, but guru devotionalism seems to be stronger and more widely accepted and practiced, around the globe than ever before. I believe this is primarily due to a long history of recorded devotional practice to one's true guru as an answer to all of life's problems. Pandit, M.P. 2007. Kularnava Tantra. Motilal Banarsidass Publishers. Delhi. http://www.scribd.com/doc/47658124/Avalon-Arthur-Sir-John-Woodroffe-Kularnava-Tantra last accessed March 23, 2014. Griffith, Ralph T.H. 1889. The Rig Veda. II Intra Text Edition CT (2007) http://www.intratext.com/ixt/ENG0039/_P8E.HTM accessed March 20, 2014. Sharvananda. 1920. Mundaka and Mandukya Upanishads. Published by Sri Ramakrisha Math. Mylapore, Madras. Srimad Bhagavad-Gita. http://www.bhagavad-gita.org last accessed March 22, 2014. Auer Falk, Nancy. 2006. In Ashrams. Living Hinduisms. Thomson/Wadsworth. pp. 245-270. Dimock, Edward C. 1963. Doctrine and Practice Among the Vaisnavas of Bengal. In History of Religions. Vol. 3, No. 1. pp. 106-127. Sarkar, Sumit. 1992. 'Kaliyuga', 'Chakri' and 'Bhakti': Ramakrishna and His Times. In Economic and Political Weekly. Vol. 27, No. 29. pp. 1543-1566. Vaidyanathan, T.G. 1989. Authority and Indentity in India. Daedalus, Vol. 118, No. 4. Another India. pp. 147-169. Organ, Troy Wilson. 1970. The Hindu Quest for the Perfection of Man. Ohio University. Athens, OH.